Whiskey lovers rejoice. Have the Koval Whiskey experience 3 ways. Koval Four Grain is made of oat, malted barley, rye, and wheat. heavy-charred American Minnesota Oak White oak. A type of wood with a tighter grain pattern yielding a smooth Whiskey with a unique and distinct banana essence. Coupled with that smoothness and spice, it’s sort of like drinking a Bananas Foster made with Rye Whiskey. Koval Rye is produced from 100% organic rye sourced from a local organic farmer collective in the Midwest. Aged from 18-24 months in 30-gallon, new charred oak barrels, this single grain Whiskey is not only pure rye, it's surprisingly light and fresh on the tongue. Rather than a kick, there's just a kiss of spice on the finish. Koval Bourbon starts with corn and then finishes off the mash bill with millet and the result is unlike any other Bourbon we’ve tasted so far with a fruit-forward character that compliments the sweetness of the corn. Everything else is just how you want it … new oak casks, proper aging, etc. Some folks talk a good innovation game, but Koval brings the small-batch and single-barrel goods. 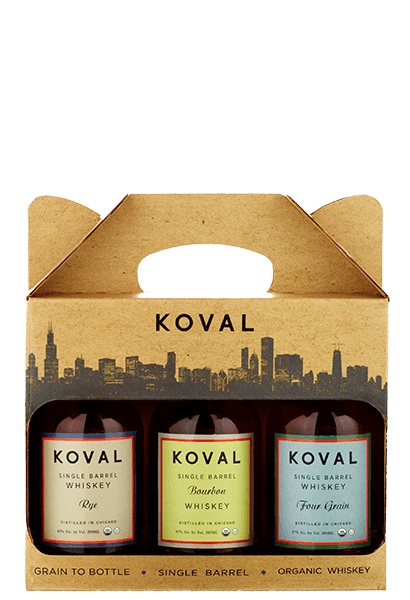 What does Koval Whiskey Gift Pack taste like? The Flavor Spiral™ shows the most common flavors that you'll taste in Koval Whiskey Gift Pack and gives you a chance to have a taste of it before actually tasting it. Banana and cream with baking spice. Rich, creamy texture with orange zest and vanilla. Full bodied, cinnamon, rye and baking spices. Sweet with touches of vanilla, honey, caramel and a hint of spice. Koval is really garbage and this rating makes me think all the other ratings are incorrect somehow... I have personally thought that this whiskey is worse than some detergents. Reference LA whiskey society- some of the most knowledgeable whisk(e)y drinkers also call this stuff terrible. Whoever enjoys this stuff must have a palate of a college student. http://www.lawhiskeysociety.com/whiskey-profile/3995/Koval-Single-Barrel-Bourbon- D or F rated liquid. Koval does an amazing job with all three whiskeys. Four grains amazing with ice, well rounded. The bourbon has great sweet caramel and vanilla notes. The Rye is sharp clean and would be perfect in a Rye Old Fashion. Overall, Koval knows how to make a good whiskey! Will have to try their other expressions very soon!